What if Eowyn was brunette? HAWT. 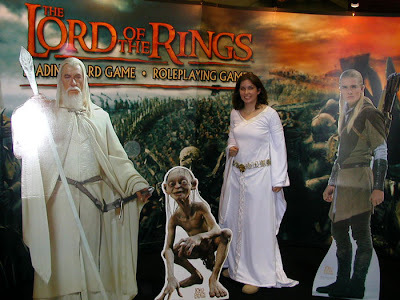 I probably would have made a more convincing Arwyn, but I really love the white dress Eowyn wore in Lord of the Rings: The Two Towers. I made this costume back in college on a limited budget. It was my second movie costume and the first dress I ever made so I used purchased patterns to make the dress: Simplicity 9891 for the sleeves and McCalls 3861 for the dress train. I used a T-shirt as a guide to make the front/top of the dress and then trimmed the neck to a V shape. For the fabric I went cheap and used polyester. Being a college student at the time I balked at the thought of purchasing 8-9 yards of wool! And while I had found the perfect wool at Hancock Fabrics, they only had 3-4 yards of it. I found this nice slightly off-white polyester of the similar weight and texture for only $2/yard at Walmart. I used a cheap polyester lining, too, of a cream color (you can tell the lining of the dress in the movie is darker in pictures of it billowing in the wind). I found an awesome gold and white braid for all of the lining details around the neck and sleeves... and when I saw the movie again it looked like I used the EXACT same braid that they used! It's thin and flat, with a white squiggle over gold. The embroidered ribbon at the neck isn't the same embroidery as the original, but I came as close as I could... I don't have an embroidery machine and purchased trim is faster anyway. For the sleeve lining I actually didn't find a good brocade or silky goldish-cream fabric, so I overlayed a gold tulle. It was hard to sew though! However, the awsome thing about this dress is that even though the bottom hem gets really dirty whenever I wear it, I can just throw it in the wash and it comes out perfectly clean and I don't even have to iron it! No trips to the drycleaners! I love how the belt turned out. It's not perfect, mostly because I couldn't fit in all 21 of the round pieces so they're a little spread apart, but it took forever to put together and I got tons of compliments on it. For the belt, I started with white cross-stitch canvas, which made it easy to place the beads. 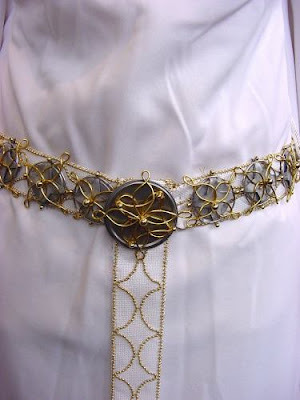 I sewed on a string of gold beads (from JoAnn's) with gold thread... by hand, counting the squares like cross-stitch in order to keep the design symmetrical and even over the whole belt. For the circle pieces, I used wooden disks which I painted with silver acrylic paint. On top of each I glued a star of craft foam, painted silver, then I used silver wire in a circle around that and gold wire for the petal shapes, and gold beads attached with beading wire. The center piece is similar, except I used an orange juice can lid instead of the wooden rounds and foam stars, since the center round is bigger and more intricate. I made that one first. The center piece is attached to the top of the vertical drape piece, which loops over the around-the-waist belt piece and attaches to itself with velcro on the back. The around-the-waist belt piece is separate, fastening with a wide buckle in front, which is hidden by the hanging piece where it wraps over it. I wore this costume to WesterCon, Comic-Con, and a local movie viewing, and it held up very well! If I thought a long blonde wig would help I would wear one, but I look funny with blonde hair.